My name is Tia and I’m a Southern California native. I grew up near the beach and have always loved it. I have lived in Hawaii and even in Las Vegas, but being land locked was not for me, so we came back to SoCal, Carlsbad to be exact, about 5 years ago and I couldn’t be happier! I have a wonderful husband, 2 awesome kids (1 girl, 1 boy), and a super drooly and cuddly mastiff. I love to surf and paddle out whenever I have the chance. I try to go at least 2-3x a week, but it is not always in the cards- depending on how busy work is! Our family also just bought a pop up trailer last year and we’ve been camping at least once a month since we got it! I love being out in nature, unplugging, and just spending quality time with the family. Tell us about your business. How did you start your business and why? What do you do? Would you go back and do anything differently? One day when I was out running at the beach, I was looking at the surfers in the water and grumbling to myself that I wished I had time to surf that day. It occurred to me that I was just a 2 Legged Mermaid- born with legs instead of a tail! I couldn’t get that phrase out of my mind and, since I have so many female surfer friends, I knew they all felt the same. 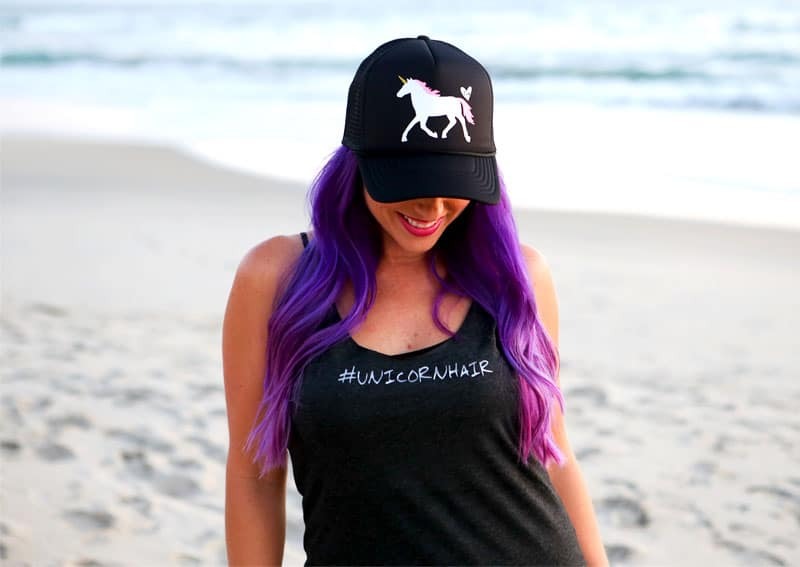 On that same run, I was reading everyone’s shirts and hats as they ran by me and thought “a hat that read 2 Legged Mermaid would be cute- but it would have to actually FIT a woman’s head!” I loved trucker hats, but hated how big and bucket-y they felt and looked on my head. When I came home, I texted my husband and said “I’m going to start making trucker hats for women” and he said “give it a try!” and that was that! I design, cut, weed, and press all of our hats by hand, but I have a manufacturer who makes our blank hats to our specs. Our hats fit a woman’s head MUCH better than most trucker hats since most trucker hats are made for men. Our hats are shallower so women can wear them with sunglasses and the sunglasses aren’t pushed down their face! If you’re not a woman, this may not make any sense, but it’s a HUGE deal! There also isn’t extra space at the top of the hat that is normally seen in trucker hats on women. We have been in business a little over 3 years and last year my husband quit his job and joined me in the biz! It’s been so awesome for us and for our family! All of this couldn’t have happened without all of our awesome customers. If I had to go back and do anything differently, I would have probably taken business classes in college. I have a master’s degree in Communicative Disorders (I was a Speech Language Pathologist) and I was also a wedding photographer, so making trucker hats is a far cry from that! Because we weren’t relying solely on the income of 2 Legged Mermaid, it wasn’t too tough or demanding at the beginning. I started with a small shop on Etsy, but outgrew that in about a year and opened our own website. I have focused on quality, not quantity, which is why we’re still handmade. I feel like we could grow quicker, make more money, if we let someone manufacture for us, but I like the custom nature of our products. I come up with all of our designs, but every customer is able to choose the color of their hat and color of the image for their hat! This is a really big deal because most women have very specific things they like to match when they wear a hat. Since every hat is bespoke for each customer, it takes much more time than if we were mass producing hats in one color combination, so that holds us back as to how much we can produce in a day. However, we are producing a product that each customer is going to love, so it’s worth it! I love creating with my hands! I am the crazy person who will spend days and days to make a Halloween costume “just right” because I just love the process. I feel the same about my designs. I want them to be universal and appealing and work really hard at that. I also really love getting to interact with customers. I love doing the Handmade Markets and getting to meet my customers in person and getting a hat on them that they love. I have turned so many woman who said they “don’t’ look good in hats” to women who buy multiple- then buy them for their friends and family to boot! I would say the thing that I like least is the accounting and numbers and such. I’m a creative by nature, so having to deal with all the money things- taxes, fees, gross receipts, net receipts- AHH- it makes my head hurt! Funny thing is that I’m actually really good and math and always loved it in school, but financial things like this are just so hard for me! Luckily my husband helps with this and we have a great accountant! My dad always told me “do what you do well to make money and pay someone else money for what they do well” when I would try to take on too much. It was hard to delegate, but it’s been much better for my sanity. Most of my inspiration comes from nature. Our tagline is “Trucker hats inspired by mermaids, the ocean, and all things rad” and I think that really sums it up. 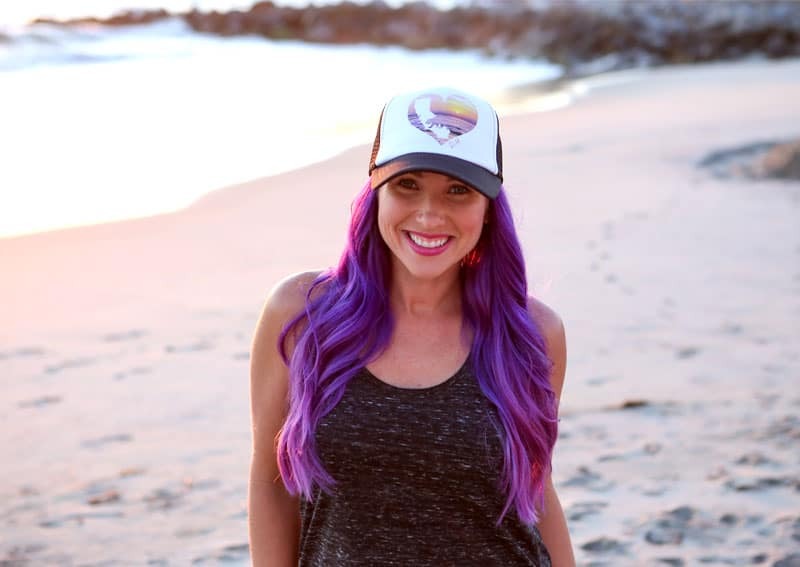 I began the company with one product, a hat that read “2 Legged Mermaid” but quickly created more designs and they were mostly inspired by mermaids and the ocean. However, as time has gone on, it’s expanded to many places and I also find inspiration from our customers. I have customers suggest certain things and, if it hits home with me and fits with our brand, I will create it! What is your farewell piece of advice for someone interested in starting their own business? If you are starting a business because you have the passion for it, you can’t go wrong. Start small, give yourself grace to make mistakes, and know that you are doing something most people are afraid to do. DO NOT compare yourself to other companies. The phrase “comparison is the thief of joy” holds so true in small businesses. Hmm, I can’t tell you the last time I just unabashedly ate a candy bar. I don’t think I have a favorite…but I can tell you my favorite food is tacos and I eat them at least 2x a week- no joke. I have loved mermaids since I was a teeny tiny girl and I have always loved playing mermaids in the pool with family and friends. We used to use dive rings around our ankles to keep our feet together to form a “tail” and I can’t tell you how many hours of my life I spent doing this growing up. I’m not going to pretend I don’t still swim like that in the pool now as an adult- but now I have an actual tail!